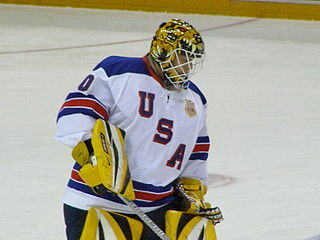 In the sports world, it is generally accepted that the NHL players who participate in the Olympics (approximately 20%) put their NHL team at a disadvantage for the remainder of the season. The NHL season does stop during the Olympic Games, but the thought is that the best NHL players leave their team to play the extra games, which will tire them out for the remainder of the NHL regular season and playoffs. But do the data really support that conventional wisdom? First, I want to mention there is a relationship between the number of players selected from a team for the Olympics and the average number of points per game for that team (2 points are awarded for an NHL win, 1 point for an overtime or shootout loss, and 0 points for a regulation loss). In general, good teams lose more players to the Olympics than bad teams. As you can see, there is a relationship between the team's performance and the number of players selected for the Olympics. Do the Olympics "Tire Out" the Best NHL Players? However, do the teams that lose more players to the Olympics have a worse post-Olympics points-per-game average? Let's find out using Minitab. 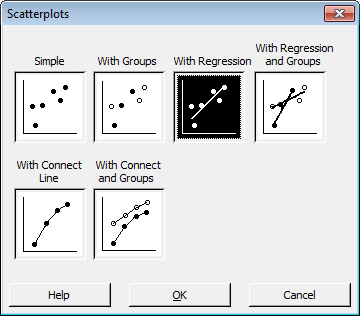 Choose Graph > Scatterplot and press the button for "With Regression." 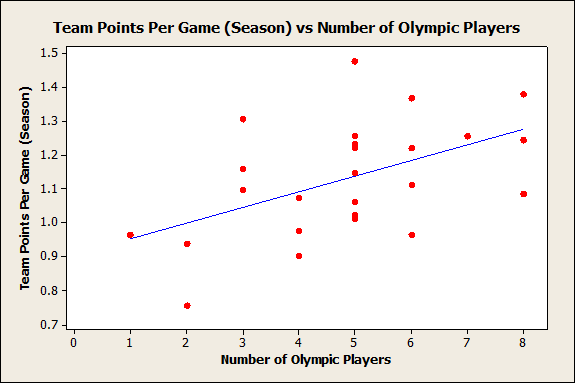 (Team Points Per Game After Olympics) / (Team Points Per Game Before Olympics). 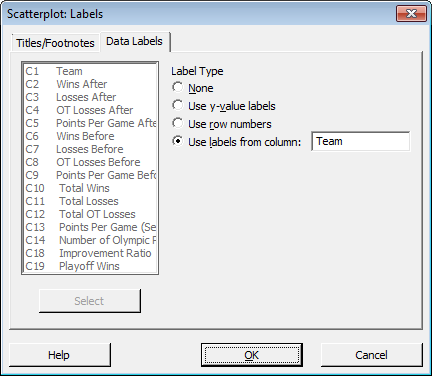 Then use the Labels options to choose the column "Team" to label each data point in the scatterplot. Press OK, and Minitab creates the scatterplot below. As you can see, based on the 2010 data displayed in the graph, the number of players a team loses to the Olympics does not appear to have much impact on the points per game for the remainder of the regular season. The blue regression line is almost flat, and although it's not shown on this graph, the p-value for this regression is 0.885, far over the usual 0.05 cutoff for significance. Let’s look beyond the regular season. 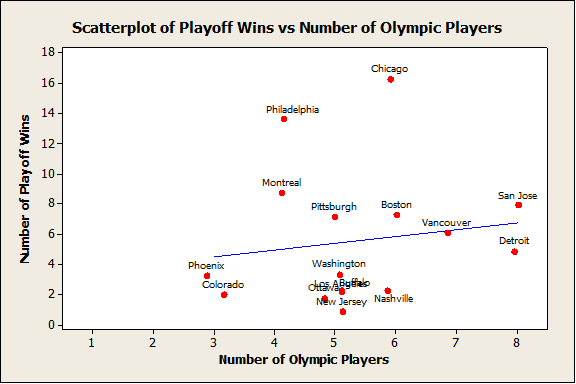 Do teams that have more players participate in the Olympics perform worse in the playoffs? Based on the 16 teams in 2010 that made the NHL playoffs, it does not appear there is much impact. I used Minitab to do a regression analysis that models the number of playoffs wins as a function of a team’s regular season points per game and the number of Olympic players. The number of Olympic players was not significant (p-value = 0.500). A scatterplot of this analysis lets us easily see the results. Admittedly, with only 16 teams, there is not much data to detect a trend. 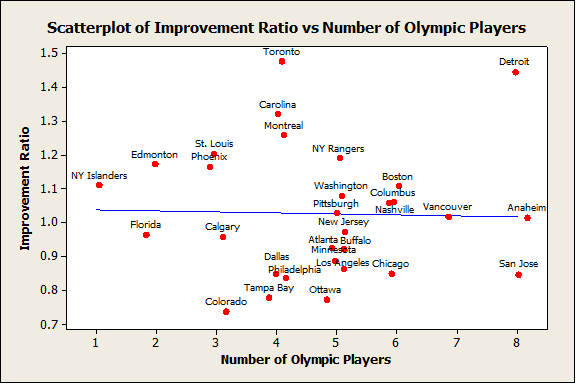 Interestingly, since the coefficient for the number of Olympic players is positive (0.59834), these data are suggesting it might be that teams with more Olympic players do better in the playoffs. A follow-up study could look at how individual players who participant in the Olympics perform before and after the Olympics. Stay tuned for a blog on that in the near future!